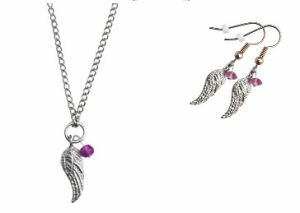 Health Earring & Necklace Set. A message in a bottle has been used for centuries to share messages around the world. The message inside this bottle is for a life filled with Good Health. These Necklace & Earrings are handmade in the USA. Wear this necklace and your life can be filled with Good Health and Inner Strength and a Guardian Angel can watch over you and Protect you.